CONCORD, N.C., March 29, 2018 (Newswire.com) – NASCAR Drive for Diversity racer Ryan Vargas, 17, will make his East Coast NASCAR Whelen All-American Series late model stock car debut in the Rev Racing No. 2 Five Star Bodies Toyota this Saturday night at Langley Speedway in Hampton, Virginia. 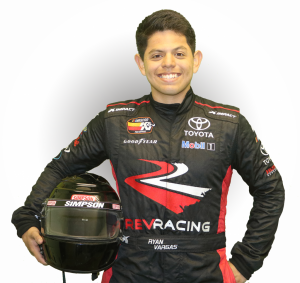 Vargas, a California native, now living in the Charlotte area, will compete in this weekend’s season-opener at Langley with the late model to get some experience on the challenging speedway for the NASCAR K&N Pro Series East race there on April 28. This will be the first time for Vargas at Langley and his first time racing a late model for Rev Racing. The popular young driver is looking forward to getting on the track. Some of NASCAR’s most storied legends have competed at Langley Speedway over the years, including seven-time Monster Energy NASCAR Cup Series champions Richard Petty and Jimmie Johnson, Chase Elliott, and former Langley Speedway track champion Denny Hamlin. Vargas said he is humbled to be able to race at tracks like Langley, which have such deep-rooted historical significance to the sport he loves so much. Vargas is a two-time winner of NASCAR’s Wendell Scott Trailblazer Award. He is competing in over 30 races inside the Drive for Diversity Program for REV Racing. He’ll compete full-time in the NASCAR K&N Pro Series East and run over a dozen races in the NASCAR Whelen All-American Series at tracks around the Southeast with the late model as well. The late models will run a pair of 75-lap feature events on Saturday night, with qualifying set for 4:30 p.m. and race time scheduled for 7 p.m. ET. Langley Speedway is a .397-mile oval that is beginning its 67th year of racing action. Fans who cannot make it to the track on Saturday can watch all the racing action at no charge on FansChoice.TV.